With these low carb peanut butter cookies you can have your cookie and eat it too! My kids were asking for me to make then some cookies recently and although they are not following a low carb diet I wanted to make cookies that we could all eat, so I made these low carb peanut butter cookies and they turned out great. As always I advise that you make them with a keto sugar substitute that you are already familiar with and that you like the taste of, otherwise you won’t enjoy the end result. I’ve used several different varieties of low carb sweeteners and we’ve settled on Lakanto granulated monkfruit blend, it tastes great and is easy to substitute in place of regular sugar. If you use my link above and the code: NOSHTASTIC you’ll get a discount at the checkout. 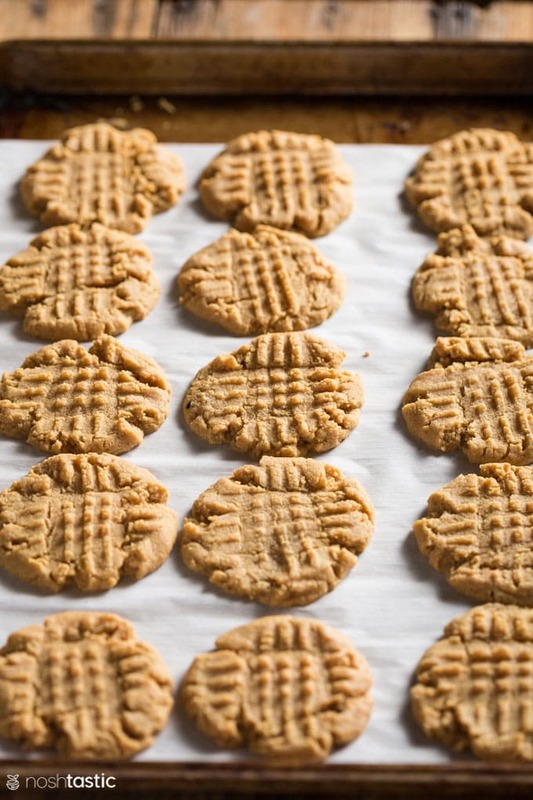 What’s the best peanut butter to use for Low Carb Peanut Butter Cookies? If you’re counting carbs then you need to use a creamy sugar free peanut butter for this recipe. There are numerous brands on the market that contain only peanuts, or peanuts and salt, either of those would work. Look for brands that labeled ‘natural’ as they tend to be sugar free, but you’ll need to read the ingredient label to be absolutely sure of what’s in it. Many brands of peanut butter contain added palm oil. There are numerous health and environmental reasons to avoid palm oil and it’s a totally unnecessary additive in peanut butter as there’s plenty oil present when the peanuts are ground, so I don’t buy those brands. Start by lining your cookie sheet, or a sheet pan, with parchment paper. Do not use waxed paper as they are not the same (I’ve made that mistake in the past) and it might stick the bottom of the cookies and is really hard to peel off if that happens. 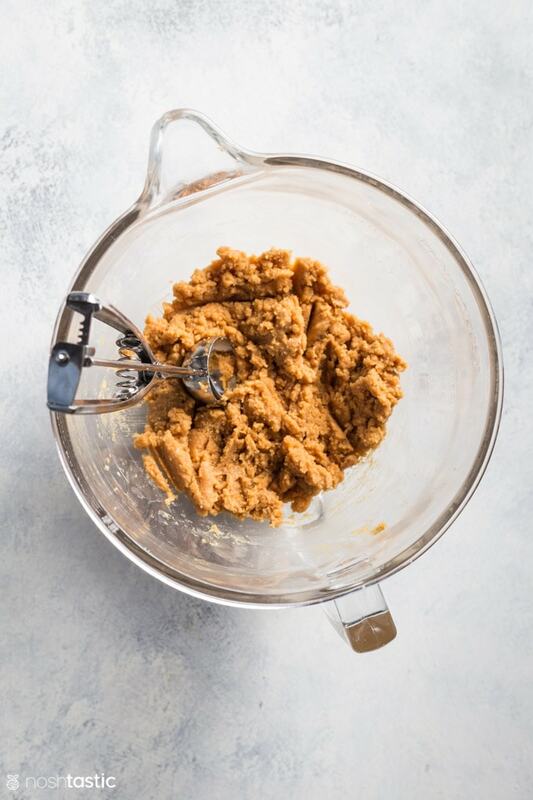 Measure out all the ingredients (see recipe card for details) for your low carb peanut butter cookies including sugar free peanut butter, a granulated low carb sugar substitute, one egg and the baking soda. Now you can go ahead and preheat your oven to 350F while you prepare the cookie dough. In a large bowl cream together the low carb sugar substitute and peanut butter until they are nice and smooth. Then add the beaten egg and baking soda and mix again until your cookie dough is evenly mixed. I find the easiest and fasted way to get evenly shaped cookies is to use a cookie scoop. It’s a nifty little gadget that looks like a mini ice cream scoop, it’s a lot easier than trying to do it with a spoon! They come in different sizes, I got 15 cookies with my scoop which measure a little over 1tbsp in volume. Measure out the cookies onto your cookies sheet, or I use a half sheet pan like I did. And ensure that they are evenly spaced apart to leave room when you flatten them, and they’ll spread a little more in the oven as they bake. 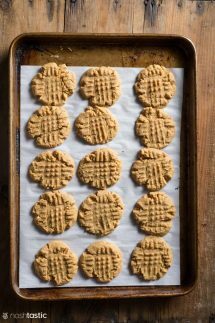 In order to get that pretty criss-cross pattern on your low carb peanut butter cookies you only need a fork! You might want to flatten the cookie dough balls a little with your hand first, then simply press them across the top with a fork in one direction, and then in the other direction to make the classic pattern. If you want plain looking peanut butter cookies that works too, just make sure you flatten them out in some form before you put them in the oven. These cookies don’t take long to cook, about 8-10 minutes in a 350F oven is usually long enough. As always though you’ll need to keep an eye on them as some ovens can run hotter or colder than others so the timing may not be the same for everyone. 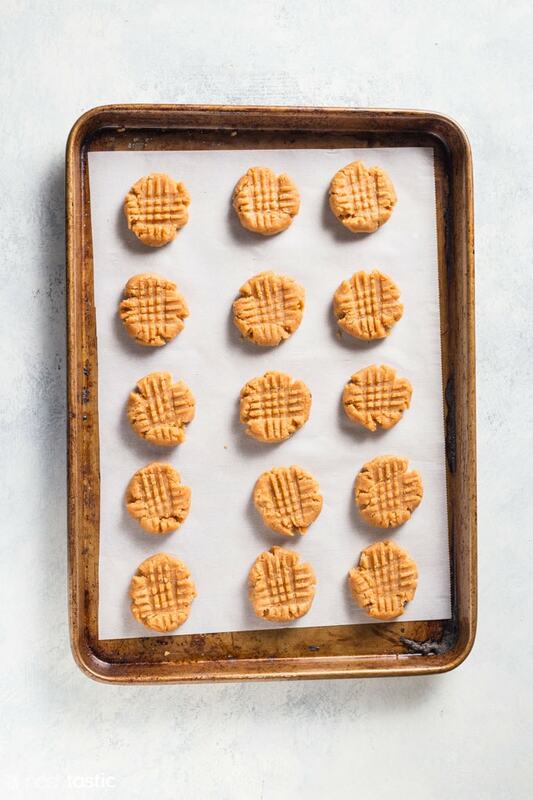 Once your low carb peanut butter cookies are fully cooked you can let them fully cool on the cookie sheet or sheet pan until you are ready to eat them! How many Carbs are in Low Carb Peanut Butter Cookies? My recipe for low carb peanut butter cookies has 3g carbs per cookie, and 2g net carbs per cookie. The total carbohydrate count for these cookies excludes carbohydrates from sugar alcohols such as erythritol because the carbohydrates in sugar alcohols (the name is confusing as they are neither sugar, nor alcohol) generally have minimal to no effect on blood sugar and contain almost zero calories making them a great option for those of us on keto or low carb diets. PIN THIS TO YOUR LOW CARB RECIPES BOARD! Lakanto Granulated Monkfruit Blend – I’ve tried several types of sweeteners and this Lakanto monkfruit and erythritol blend is my favorite both in terms of taste and how it bakes. If you use my code ‘NOSHTASTIC’ you’ll get 20% off your order if you buy via the link above. Sugar Free Peanut Butter – make sure you use a sugar free peanut butter otherwise the carb count will be very high. Cookie Scoop – in my opinion a small cookie scoop is a must have gadget! it also means your cookies are the same size. Half Sheet Pan – a cookie sheet works too but I think a half sheet pan is more versatile. Parchment paper – makes for much easier clean up, don’t use waxed paper as they are not the same. 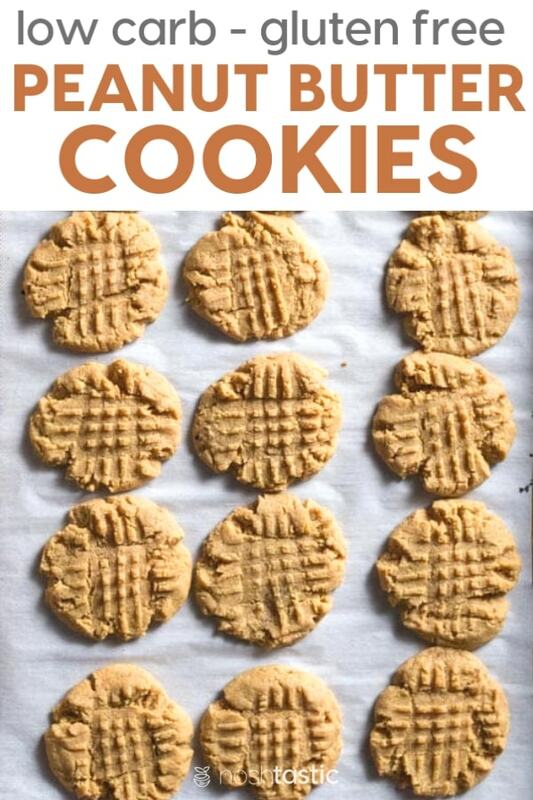 Quick and really easy to make my low carb peanut butter cookies! 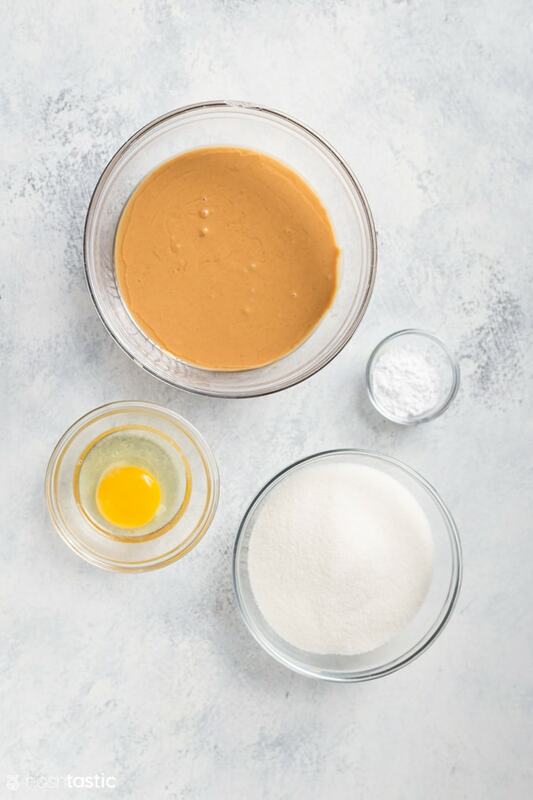 Cream the peanut butter, low carb sugar substitute, until fully combined. 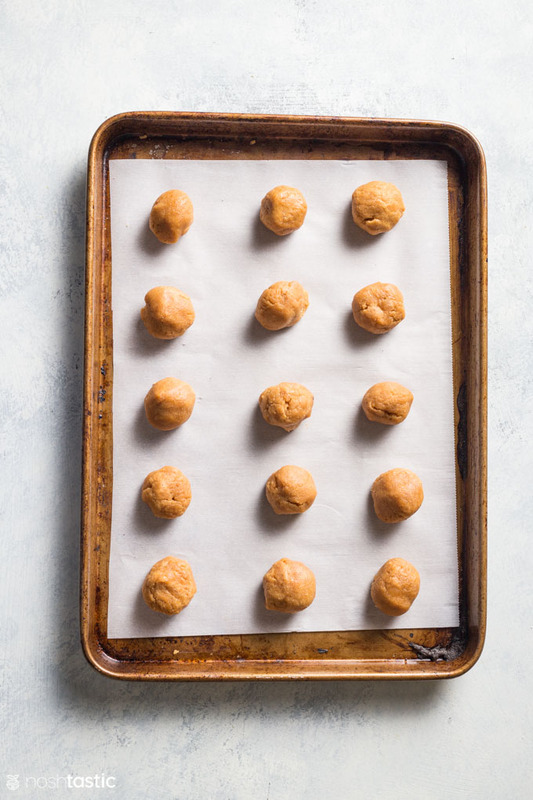 Use a cookie scoop to create balls of cookie dough and place them on your pre-lined cookie sheet. Press each cookie evenly down with a fork to create a criss cross pattern on the top. Bake for around 8- 10 minutes, then let them cool on the cookie sheet. There are 2g net carbs per cookie, assuming 15 cookies per batch. Thank you, Shena. Your recipes are always so delicious, and though I am not low carb. I tweek it for us, being vegan, and it works out great. 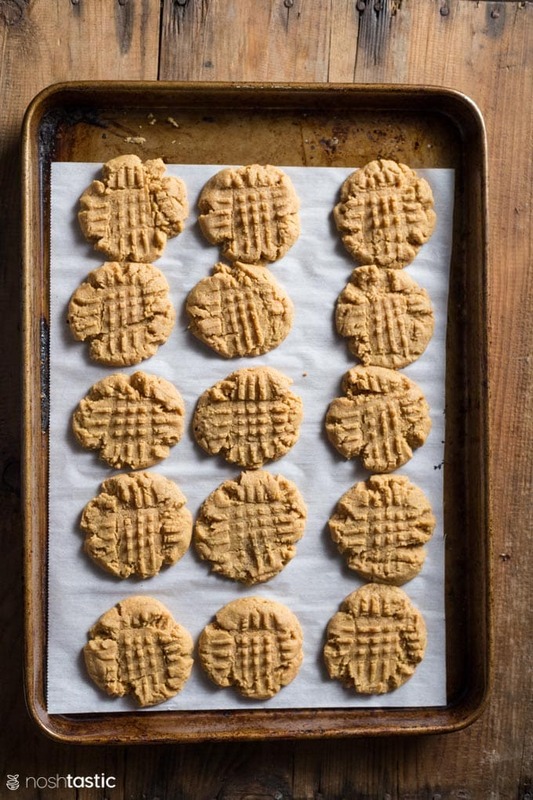 I was looking for a low carb dessert recipes and came across this peanut butter cookie recipe! They look simple to make and very delicious! Thanks for posting this recipe! Looking forward to making these this weekend!